This version has been updated silently, without a change to the posted "last modified" date. This means that without ParanoidPaul, you wouldn't have known the document was updated! The date displayed for this row is when ParanoidPaul detected the change. Nov 21, 2017 Section removed: "WHAT REQUIREMENTS APPLY TO INSTANT, VIDEO, AND AUDIO MESSAGES?" Sep 21, 2017 Changes under "What happens if you violate this policy?" and "What is Comcast's DMCA policy? "; The DMCA Notifications address has been updated. Mar 8, 2017 Changes concerning copyright and the copyright alerts system. Nov 1, 2016 The paragraph that answers the question "What data consumption requirements apply to the Service?" has been updated. Jun 1, 2016 Several formatting and terminology changes including updates to the section "What Data Consumption Requirements Apply to the Service? 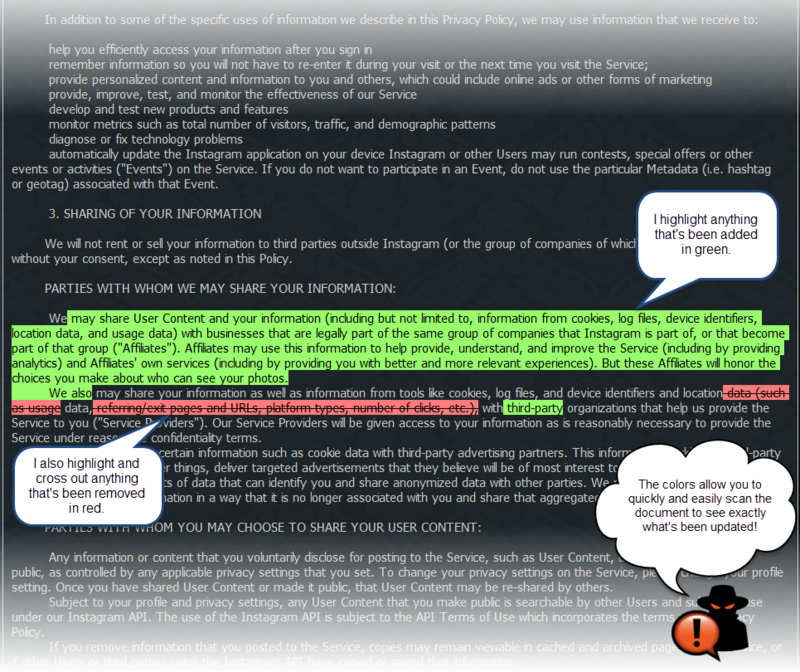 "; The section "What Requirements Apply to Personal Web Pages and File Storage?" has been removed. This version has been updated silently, without a change to the posted "last modified" date. This means that without ParanoidPaul, you wouldn't have known the document was updated! The date displayed for this row is when ParanoidPaul detected the change. Apr 2, 2016 Several links have been updated. This version has been updated silently, without a change to the posted "last modified" date. This means that without ParanoidPaul, you wouldn't have known the document was updated! The date displayed for this row is when ParanoidPaul detected the change. Mar 4, 2016 Several links have been updated. Sep 5, 2014 Minor update: some terminology changes and updated links. May 24, 2013 This is the initial version that ParanoidPaul captured. It is not necessarily the first version of the document. Comcast's goal is to provide its customers with the best residential cable Internet service possible. In order to help accomplish this, Comcast has adopted this Acceptable Use Policy (the "Policy"). This Policy outlines acceptable use of the residential XFINITY Internet service, including Comcast-provided XFINITY WiFi Internet service (collectively, the "Service"). This Policy is in addition to any restrictions or conditions contained in the Comcast Agreement for Residential Services (the "Subscriber Agreement") available at http://www.xfinity.com/policies. The Frequently Asked Questions ("FAQs") at http://customer.xfinity.com/help-and-support/internet/comcast-acceptable-use-policy/ explain how Comcast implements and applies many of the provisions contained in this Policy. All capitalized terms used in this Policy that are not defined here have the meanings given to them in the Subscriber Agreement. All residential XFINITY Internet customers (the "customer," "user," "you," or "your") and all others who use the Service must comply with this Policy. Your failure, or others' failure, to comply with this Policy could result in the suspension or termination of your or their Service accounts. Therefore, you should take steps to ensure that others you permit to use your Service are aware of this Policy and agree to abide by it. If you are unwilling to comply with this Policy, you must immediately stop all use of the Service and notify Comcast so that it can close your account. DOES THIS POLICY APPLY TO MY USE OF XFINITY WIFI-IDENTIFIED SERVICES INSIDE AND OUTSIDE OF MY PREMISES AND IN PUBLIC PLACES? This Policy applies to your use of the Service if you are a residential XFINITY Internet customer who accesses Comcast-provided, XFINITY WiFi-identified services inside or outside of your premises or in public places using an XFINITY Internet login and password. You can learn more about Comcast-provided XFINITY WiFi services by going to the portal at www.comcast.com/wifi/default.htm. In the event certain provisions of this Policy may not apply to all uses of XFINITY WiFi-identified services, we explain those exceptions in the FAQs at www.comcast.com/wifi/faqs.htm. Comcast may revise this Policy from time to time by posting a new version on the web site at http://xfinity.comcast.net/ or any successor URL(s) (the "XFINITY Web site"). Comcast will use reasonable efforts to make customers aware of any changes to this Policy, which may include sending email announcements or posting information on the XFINITY Web site. Revised versions of this Policy are effective immediately upon posting. Accordingly, customers of the Service should read any Comcast announcements they receive and regularly visit the XFINITY Web site and review this Policy to ensure that their activities conform to the most recent version. You can send questions regarding this Policy to, and report violations of it, at http://customer.xfinity.com/help-and-support/account/ways-to-get-help/. To report child exploitation or another child-related incident involving the Internet, go to http://constantguard.comcast.net/help/report-abuse/. WHAT USES AND ACTIVITIES DOES COMCAST PROHIBIT? address that adheres to the dynamic host configuration protocol ("DHCP"). You may not configure the Service or any related equipment to access or use a static IP address or use any protocol other than DHCP unless you are subject to a Service plan that expressly permits you to do so. You are responsible for your own compliance with this Policy. You are also responsible for any use or misuse of the Service that violates this Policy by anyone else you permit to access the Service (such as a friend, family member, or guest) with one exception: In cases where you permit others to access your Comcast-provided, XFINITY WiFi-identified Internet Service with their own login information, those users are responsible for complying with all then-current terms and policies that apply to their access. You can learn more about Comcast-provided WiFi access at www.comcast.com/wifi/default.htm. Comcast recommends against enabling file or printer sharing unless you do so in strict compliance with all security recommendations and features provided by Comcast and the manufacturer of the applicable file or printer sharing devices. Any files or devices you choose to make available for shared access on a home LAN, for example, should be protected with a strong password or as otherwise appropriate. In all cases, you are solely responsible for the security of any device you connect to the Service, including any data stored or shared on that device. It is also your responsibility to secure the Customer Equipment and any other Premises equipment or programs not provided by Comcast that connect to the Service from external threats such as viruses, spam, bot nets, and other methods of intrusion. HOW DOES COMCAST ADDRESS INAPPROPRIATE CONTENT AND TRANSMISSIONS? Comcast reserves the right to refuse to transmit or post, and to remove or block, any information or materials, in whole or in part, that it, in its sole discretion, deems to be in violation of Sections I or II of this Policy, or otherwise harmful to Comcast's network or customers using the Service, regardless of whether this material or its dissemination is unlawful so long as it violates this Policy. Neither Comcast nor any of its affiliates, suppliers, or agents have any obligation to monitor transmissions or postings (including, but not limited to, email, file transfer, blog, newsgroup, and instant message transmissions) made on the Service. However, Comcast and its affiliates, suppliers, and agents have the right to monitor these transmissions and postings from time to time for violations of this Policy and to disclose, block, or remove them in accordance with this Policy, the Subscriber Agreement, and applicable law. The Service may not be used to communicate or distribute email or other forms of communications in violation of Section I of this Policy. As described below in Section III of this Policy, Comcast uses reasonable network management tools and techniques to protect customers from receiving spam and from sending spam (often without their knowledge over an infected computer). Comcast's anti-spam approach is explained in the FAQs under the topic "What is Comcast doing about spam?" located at http://customer.xfinity.com/help-and-support/internet/reducing-spam-email/. Comcast is not responsible for deleting or forwarding any email sent to the wrong email address by you or by someone else trying to send email to you. Comcast is also not responsible for forwarding email sent to any account that has been suspended or terminated. This email will be returned to the sender, ignored, deleted, or stored temporarily at Comcast's sole discretion. If you cancel or terminate your Service account for any reason, all email associated with that account (and any secondary accounts) will be permanently deleted as well. If Comcast believes in its sole discretion that any subscriber name, account name, or email address (collectively, an "identifier") on the Service may be used for, or is being used for, any misleading, fraudulent, or other improper or illegal purpose, Comcast (i) reserves the right to block access to and prevent the use of any of these identifiers and (ii) may at any time require any customer to change his or her identifier. In addition, Comcast may at any time reserve any identifiers on the Service for its own purposes. Each user is responsible for the contents of his or her instant, video, and audio messages and the consequences of any of these messages. Comcast assumes no responsibility for the timeliness, mis-delivery, deletion, or failure to store these messages. If you cancel or terminate your Service account for any reason, all instant, video, and audio messages associated with that account (and any secondary accounts) will be permanently deleted as well. Comcast manages its network with one goal: to deliver the best possible broadband Internet experience to all of its customers. High-speed bandwidth and network resources are not unlimited. Managing the network is essential as Comcast works to promote the use and enjoyment of the Internet by all of its customers. The company uses reasonable network management practices that are consistent with industry standards. Comcast tries to use tools and technologies that are minimally intrusive and, in its independent judgment guided by industry experience, among the best in class. Of course, the company's network management practices will change and evolve along with the uses of the Internet and the challenges and threats on the Internet. The need to engage in network management is not limited to Comcast. In fact, all large Internet service providers manage their networks. Many of them use the same or similar tools that Comcast does. If the company didn't manage its network, its customers would be subject to the negative effects of spam, viruses, security attacks, network congestion, and other risks and degradations of service. By engaging in responsible network management including enforcement of this Policy, Comcast can deliver the best possible broadband Internet experience to all of its customers. Visit Comcast's Network Management page at http://networkmanagement.comcast.net/ for more information. Comcast uses various tools and techniques to manage its network, deliver the Service, and ensure compliance with this Policy and the Subscriber Agreement. These tools and techniques are dynamic, like the network and its usage, and can and do change frequently. For example, these network management activities may include (i) identifying spam and preventing its delivery to customer email accounts, (ii) detecting malicious Internet traffic and preventing the distribution of viruses or other harmful code or content, (iii) temporarily lowering the priority of traffic for users who are the top contributors to current network congestion, and (iv) using other tools and techniques that Comcast may be required to implement in order to meet its goal of delivering the best possible broadband Internet experience to all of its customers. Comcast applies a monthly data consumption threshold to XFINITY Internet accounts in most of our service areas. The company retains the right to trial or adopt a different data consumption threshold or other usage plan for the Service at any time. If we do this we will notify customers and, if necessary, post an updated version of this Policy. You can learn about the data plan that applies in your area by going to https://dataplan.xfinity.com/. You can view your current data usage at any time by logging into your My Account page and viewing the data usage meter at https://customer.xfinity.com/MyServices/Internet/UsageMeter/. You can also use the XFINITY My Account mobile app to view your data usage. Comcast reserves the right immediately to suspend or terminate your Service account and terminate the Subscriber Agreement if you violate the terms of this Policy or the Subscriber Agreement, or if anyone else you permit to access the Service violates this Policy. Comcast does not routinely monitor the activity of individual Service accounts for violations of this Policy, except for determining aggregate data consumption in connection with Section IV of this Policy. However, in the company's efforts to promote good citizenship within the Internet community, it will respond appropriately if it becomes aware of inappropriate use of the Service. Comcast has no obligation to monitor the Service and/or the network. Comcast and its suppliers reserve the right at any time to monitor bandwidth, usage, transmissions, and content in order to, among other things, operate the Service; identify violations of this Policy; and/or protect the network, the Service and Comcast users. Comcast prefers to inform customers of inappropriate activities and give them a reasonable period of time in which to take corrective action. Comcast also prefers to have customers directly resolve any disputes or disagreements they may have with others, whether customers or not, without Comcast's intervention. However, if the Service is used in a way that Comcast or its suppliers, in their sole discretion, believe violates this Policy, Comcast or its suppliers may take any responsive actions they deem appropriate under the circumstances with or without notice. These actions include, but are not limited to, temporary or permanent removal of content, filtering of Internet transmissions, and the immediate suspension or termination of all or any portion of the Service. Neither Comcast nor its affiliates, suppliers, or agents will have any liability for any of these responsive actions. These actions are not Comcast's exclusive remedies and Comcast may take any other legal or technical actions it deems appropriate with or without notice. Comcast reserves the right to investigate suspected violations of this Policy, including the gathering of information from the user or users involved and the complaining party, if any, and examination of material and data on Comcast's servers and network. During an investigation, Comcast may suspend the account or accounts involved and/or remove or block material that potentially violates this Policy. You expressly authorize and consent to Comcast and its suppliers cooperating with (i) law enforcement authorities in the investigation of suspected legal violations, and (ii) and system administrators at other Internet service providers or other network or computing facilities in order to enforce this Policy. Upon termination of your Service account, Comcast is authorized to delete any files, programs, data, email and other messages associated with your account (and any secondary accounts). HOW DOES COMCAST COMMUNICATE WITH CUSTOMERS ABOUT COPYRIGHT? Comcast is committed to complying with U.S. copyright and related laws, and requires all customers and users of the Service to comply with these laws. Accordingly, you may not store any material or content on, or access, share or disseminate any material or content over, the Service (or any part of the Service) in any manner that constitutes an infringement of third party intellectual property rights, including rights granted by U.S. copyright law. Comcast provides two independent methods for copyright owners to communicate information about alleged infringements to us, and for us to inform our customers about them: as described below, Comcast participates in the Copyright Alerts System, and also complies with the Digital Millennium Copyright Act. You may receive alerts under either or both of these methods if your Service account is identified by a copyright owner as having been used in connection with acts of alleged copyright infringement. WHAT IS THE COPYRIGHT ALERTS SYSTEM? The Copyright Alerts System is part of an Internet service provider and content industry initiative to help make people aware of appropriate ways to access and share content online, in particular over peer-to-peer file sharing programs. Copyright owners routinely participate in online peer-to-peer file sharing programs to see if their content is being improperly used or shared. If the copyright owner believes its content was uploaded or downloaded improperly, it can record the Internet Protocol or IP address that was used to access the content over these services. The IP address identifies the Internet service provider who uses the address for its customers; it does not identify an individual person. The copyright owner will then send a notice to the Internet service provider that contains the IP address along with other information such as the date and time of the event, the name of the file sharing program, and an identification of the content. The Internet service provider will then identify the account holder using that IP address in conjunction with the other information and send an alert to that customer. In Comcast's case, we send the alert in two forms: an in-browser notice and an email to the primary account holder of the Service. Comcast prefers to inform customers of inappropriate activities involving their Service and give them a reasonable period of time in which to take corrective action. Regardless of how many notices Comcast receives from copyright owners under the Copyright Alerts System, Service customers should not receive more than one alert in any seven day period. To learn more about how Comcast supports the Copyright Alerts System, including your options as a Service account owner and user, go to http://www.xfinity.com/copyrightalerts. WHAT IS COMCAST'S DMCA POLICY? Owners of copyrighted works who believe that their rights under U.S. copyright law have been infringed may take advantage of certain provisions of the Digital Millennium Copyright Act of 1998 (the "DMCA") to report alleged infringements. It is Comcast's policy in accordance with the DMCA and other applicable laws to reserve the right to terminate the Service provided to any customer or user who is either found to infringe third party copyright or other intellectual property rights, including repeat infringers, or who Comcast, in its sole discretion, believes is infringing these rights. Comcast may terminate the Service at any time with or without notice for any affected customer or user. HOW DO COPYRIGHT OWNERS REPORT ALLEGED INFRINGEMENTS TO COMCAST UNDER THE DMCA? Copyright owners may report alleged infringements of their works by sending Comcast's authorized agent a notification of claimed infringement that satisfies the requirements of the DMCA. Upon Comcast's receipt of a satisfactory notice of claimed infringement for these works, Comcast will respond expeditiously to either directly or indirectly (i) remove the allegedly infringing work(s), if applicable or (ii) disable access to the work(s). Comcast will also notify the affected customer or user of the Service of the removal or disabling of access to the work(s). Copyright owners may use their own notification of claimed infringement form that satisfies the requirements of Section 512(c)(3) of the U.S. Copyright Act. Under the DMCA, anyone who knowingly makes misrepresentations regarding alleged copyright infringement may be liable to Comcast, the alleged infringer, and the affected copyright owner for any damages incurred in connection with the removal, blocking, or replacement of allegedly infringing material. If you receive a DMCA notification of alleged infringement as described above, and you believe in good faith that the allegedly infringing works have been removed or blocked by mistake or misidentification, then you may send a counter notification to Comcast. Upon Comcast's receipt of a counter notification that satisfies the requirements of the DMCA, Comcast will provide a copy of the counter notification to the person who sent the original notification of claimed infringement and will follow the DMCA's procedures with respect to a received counter notification. In all events, you expressly agree that Comcast will not be a party to any disputes or lawsuits regarding alleged copyright infringement.